Submitted by jan.svec on 27. January 2009 - 15:07. IMAP & Gmail Labs note: If you are using the Gmail Labs, please make sure that you have enabled the IMAP access into the All Mails folder. You can check this in the Settings/Labels page of your Gmail account. 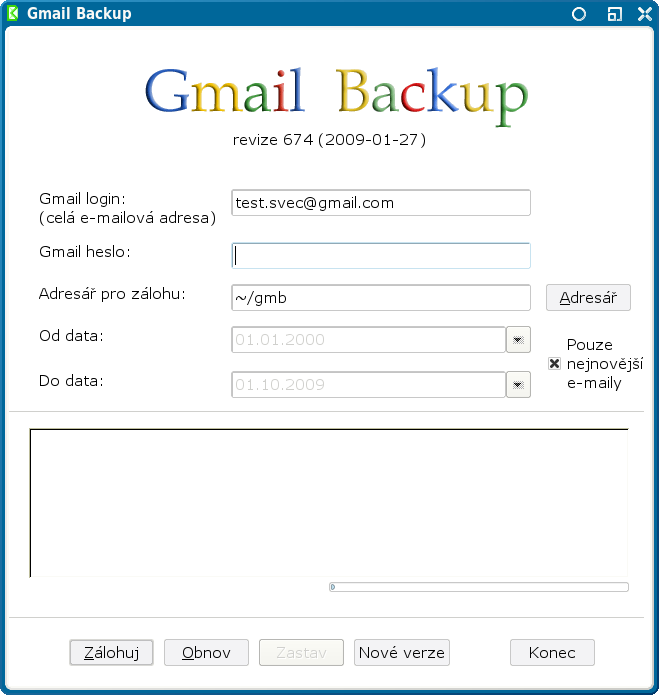 Otherwise, Gmail Backup will tell you, that you are using "Unsupported language of Gmail"! Bug reporting: Please use our forum for reporting bugs and wishes. Thanks! #1Submitted by Veraert (not verified) on 29. January 2009 - 13:54. #2Submitted by Veraert (not verified) on 29. January 2009 - 13:56. #3Submitted by Veraert (not verified) on 29. January 2009 - 13:57. #4Submitted by Steve Wiseman (not verified) on 11. February 2009 - 19:27. Why not create a pro version? I sell software, so I am coming from that perspective. This tool is great - I love it. It works, and works well. I had over 30,000 messages and it backed up my account with zero issues. Why not create a pro version that runs at startup, and backs up your gmail account on a schedule...and maybe even with failure notifications that are emailed. That way I could throw this thing on a server and it would back it up every day. If it failed, I would get an email. I would pay at least $100 for this. Hell, I would even write a blog article about it...I like this thing so much. Now that I think about it...I think I will...even for the current version you have. Think about it. I would much rather see you sell this thing and have a company built around it...and be around in 5 years...instead of seeing the project get left behind because you are busy with something else. #5Submitted by Gerald (not verified) on 20. February 2009 - 14:42. #6Submitted by Gmail (not verified) on 28. February 2009 - 14:43. #7Submitted by filip.jurcicek on 28. February 2009 - 17:35. Try 0.107. If you still have any problems, give us more details. Thanks! #8Submitted by Anonymous on 17. April 2011 - 20:53.